Easy to grow house plant Great for the house, apartment, office or dorm Provide bright, indirect or artificial light Trim as needed The plant you will receive is growing in a 4" pot. 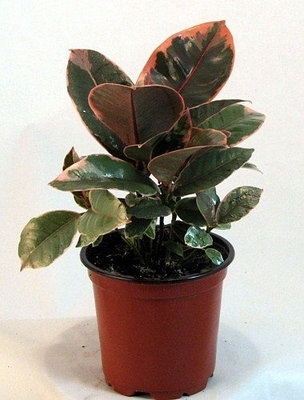 Ficus elastica is the classic Rubber Tree, Rubber Plant or India Rubber Plant. Native to India and Malaysia, elastica is among the oldest plants used as houseplants worldwide. As a houseplant, Ficus is very popular. Able to adapt to and endure lower light conditions and generally poor treatment, The Rubber Tree is a winner indoors. Provide as much light as possible, keep away from cold and drafts in winter, keep soil lightly to moderately moist with good drainage. Most any soil will be fine and largely sandy soils mixed with some organics are ideal. Light fertilization is best. "Strawberry & Cream RUBBER TREE" - Nice selection of this tropical, evergreen tree; large, shiny leaves attractively outlined in strawberry-pink; indoor or summer patio site, outdoors in mildest Inland areas.